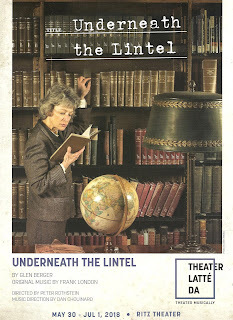 I've seen Glen Berger's funny and profound little play Underneath the Lintel twice at the Minnesota Fringe Festival, brilliantly performed by local actor Pat O'Brien. What starts out as an amusing scavenger hunt around the world turns into a much deeper search for meaning in life. It's the last thing I expected Theater Latte Da to do, a company that doesn't do musical theater, they do theater musically. There was no music in this play that I remembered, other than a mention or two of a song. But in true Latte Da fashion, they've added music to this play (with the permission of the playwright), and made it better, deeper, richer. It's still the same quirky librarian searching for meaning (here played by a woman, another twist, that works beautifully), but with original music (composed by Frank London) that enhances the storytelling and helps the audience feel it more deeply. The moment #TCTheater favorite Sally Wingert enters the room (in a unique way I won't spoil here), she has the audience in the palm of her hand. 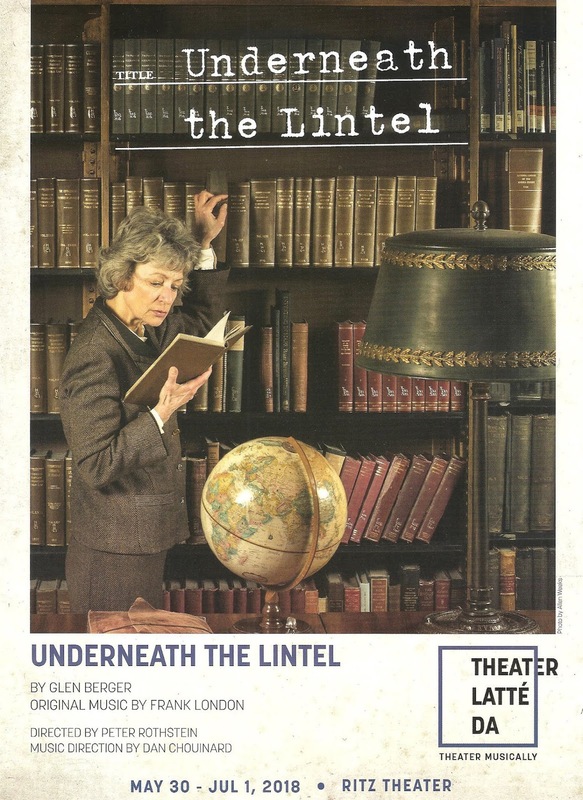 The premise of the play is that she is a Dutch librarian giving a presentation, which allows her to speak directly to the audience, because we're part of the story (and be sure to turn off your phone, because if you don't, and it rings, you will get the stink eye from Sally Wingert). This librarian's quiet, simple life changed for good (who can say if it was for the better) when she found in the overnight slot a book that was over 100 years overdue. This discovery sends her on a quest around the world searching for the mysterious A., from a Chinese laundry in London, to a traffic office in Germany, to a post office box in China, and all the way to Australia. 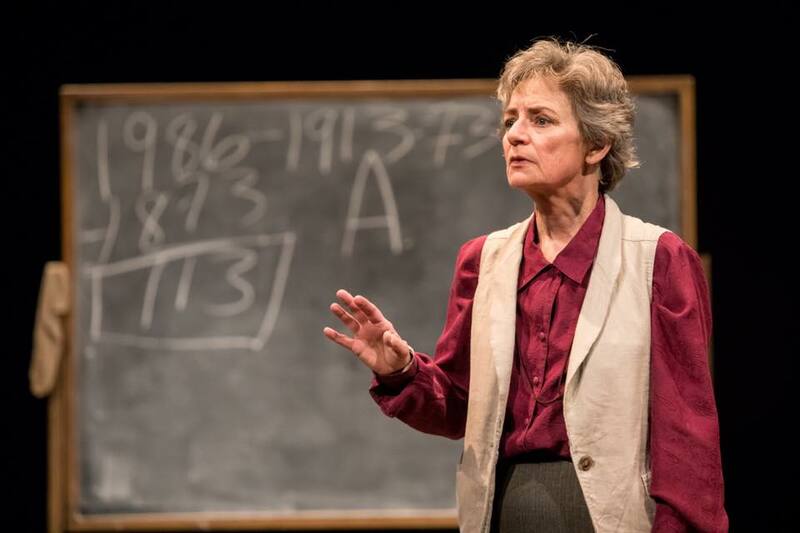 She soon theorizes that she is on the trail of the mythical Wandering Jew, who is over a thousand years old and can never rest or die, and cannot tell anyone who he is, but just wanders the earth and subtly puts his mark on where he's been. The story captivates the audience as much as it captivates the librarian, as the clues cleverly draw us from one revelation to the next, tying things together in a way that makes you believe this myth could be real. But this search, while fulfilling, also devastates the librarian as she looses everything in her life, and begins to think about her regrets, and ponders the meaning of her very existence. The under 60-minute play has been stretched out to 90, with the addition of music, and perhaps allowing the story to take a little more time. The script very cleverly brings us along on this very funny and engaging mystery, then reveals the deeper meaning. Peter Rothstein's direction gets that balance of funny and serious just right, and sets a nice pace for the story as it builds to its conclusion. And Sally Wingert embodies this librarian wholly and presents these "evidences" as if she's discovering them for the first time. She'll make you laugh with her silly antics one minute, and break your heart with the harsh realities of life the next. But what about the music, you ask? The librarian has a little tape player (this is 1986, BTW) which she plays while telling her story, along with a slide projector showing images of her journey. But sometimes when she pushes play on the tape player, there appears behind the black scrim musicians Dan Chouinard playing piano or accordion and Natalie Nowytski with haunting vocals. As more of the behind-the-scrim world is revealed, we stacks and stacks of luggage. They musicians are not really there, they're like a dream from another time or place. On the surface this is a simple little story being told, but there are many complicated elements of production (props, music, recordings, slides, lighting) that all come together beautifully, thanks to scenic designer Michael Hoover, lighting designer Barry Browing, sound designer John Acarregui, projection designer Katy Maxwell, and the whole production team. After the play, my friend asked me "do you think she's the Wandering Jew?" "As much as any of us are," I responded. Maybe we're all the Wandering Jew, doomed (or blessed) to wander the earth in search of meaning. Desperate to make our mark, to leave something behind that proves WE WERE HERE. This is the kind of play (with music) that inspires such musings, after taking you on a thoroughly captivating ride through time, place, and ideas.